Bonnie Vale Campground is deep within the Royal National Park in between the seaside towns of Bundeena and Maianbar. From the main park entrance at Loftus it is a 25km drive to the Bonnie Vale entrance located on Seabreeze Lane just off of Bundeena Drive. For backpack campers it is possible to take the ferry from Cronulla and arrive on foot via a 15 minute walk from Bundeena wharf. 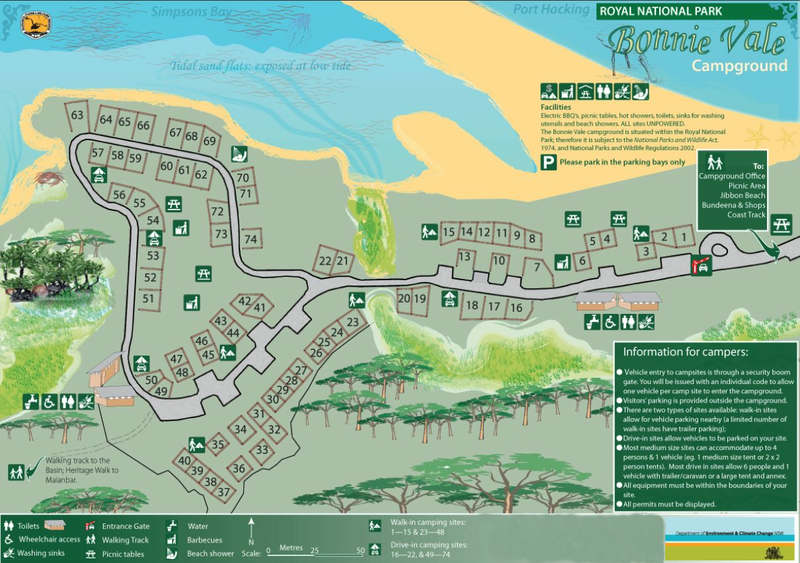 Bonnie Vale boasts 74 campsites which dot both the beach and the bush. All the basic amenities are available including flush toilets, hot showers, washing sinks and drinking water. None of the sites are powered. While wood fired and solid fuel barbecues are prohibited there are several gas fueled barbecues conveniently located at the nearby picnic tables. Bonnie Vale does have limited boat launch which is suitable for small tinnies or inflatables. The launch is not paved and crosses over a sand dune so a large 4WD drive is recommended if you are planning to launch a boat from here. There are future plans to upgrade the launch using a log and chain system. Bookings are essential for Bonnie Vale and you can book online.